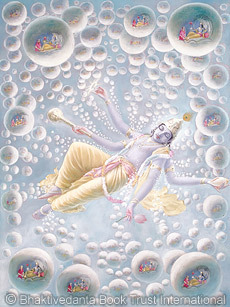 Krishna’s expansion Maha-Vishnu creates the material world. From Him the innumerable material universes come forth and are withdrawn in due course. The Bhagavad-gita explains that the underlying, absolute cause of all causes is an unlimited conscious being and that the manifestations of material energy are exhibitions of that being’s conscious will and plan. The idea of a creator agrees with our experience, because we see that everything develops by someone’s plan. The more complex the plan, the more intelligent the person who developed it. Krishna’s intelligence is unlimited, surely beyond our comprehension. As tiny expansions of Krishna’s energy, we can create something small. But He can easily create the whole material world.